The program is intended for currently endorsed and prospective ASA Simulation Endorsed Network (SEN) programs as well as any individuals involved in simulation training of Anesthesiologists. It will focus on identifying best practices for MOCA® courses and set future goals for the SEN. It will also allow a forum for centers to share experiences as they plan for OSCE preparation for their residents. This stand-alone one-day meeting will feature reports and lectures, breakout sessions, and networking opportunities. It is designed to solicit input from endorsed programs, programs in the application process, and from Simulation Editorial Board (SEB) members. Identify common barriers seen in medical education of adult learners and describe how various educational techniques can be used to overcome these. Discuss activities and updates relevant to the Maintenance of Certification process, the role of the Simulation Education Board (SEB) and the ABA in providing direction and guidance for the MOCA centers, and the efforts and results from the SEB workgroups. Identify and implement an action plan pertaining to one or more of the following workshops: Preparing Your Residents for the OSCE Exam; How to Make the ACLS-EP/MOCA Combined Course Format Work for Your Accredited Simulation Program; Faculty Development: Debriefing; Teaching Point of Care Ultrasound in Anesthesiology: Obstacles and Ideas; and Goal Orientation and Response to Failure. 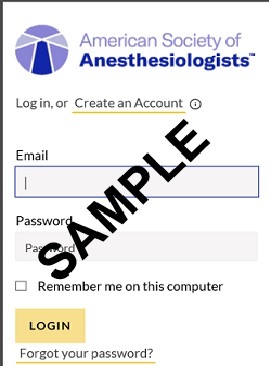 If you are registering on behalf of others, you will need to know the attendee's ASA log-in credentials. Step 1: Click on registration link below. Step 2: You will see the following screen. Members: Log in with your email address and password. Nonmembers: Click "Create an Account", and follow the prompts to create a profile. Step 3: After logging in, you will automatically be redirected to complete the registration process.